This article demonstrates how one can create a shopping cart item where the user can see the product detail and adjust the amount. You should inherit the SimpleListViewVisualItem class and add the necessary elements. In this case you will add two buttons for adjusting the amount and three LightVisualElements for displaying the product details. You will need a single label to display the current amount as well. 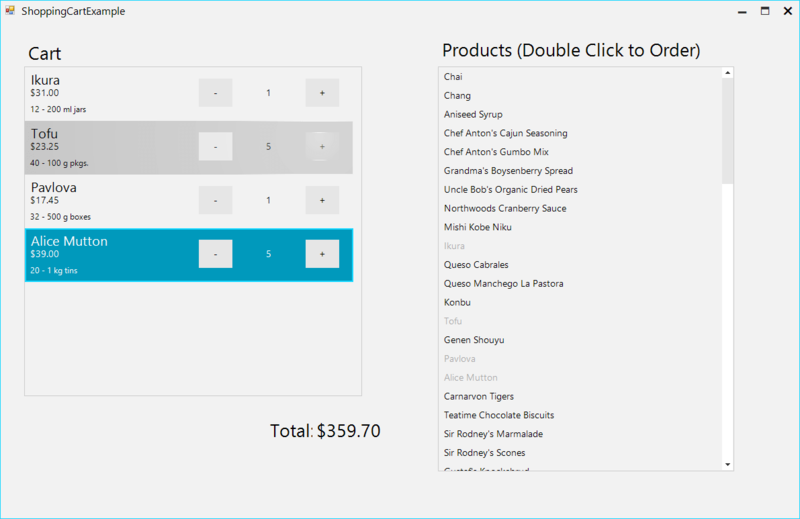 You will add the elements to StackLayoutElements which will allow you to create the layout. The example is bound to a custom created business object which allows you to easily get the data and calculate the total amount.